Based on the high brightness third generation synchrotron sources and development of tunable monochromators with sub-meV resolution, nuclear resonant X-ray spectroscopy has become a relatively new spectroscopic method in recent years and widely used to study materials under extreme conditions. Nuclear resonant X-ray spectroscopy can be divided into two methods: nuclear resonant inelastic X-ray scattering (NRIXS) and nuclear forward scattering (NFS). From NRIXS, density of states can be acquired and important dynamic, thermodynamic, and elastic information derived such as vibrational kinetic energy, vibrational entropy, Debye temperature and sound velocities. From NFS, hyperfine interaction parameters can be acquired giving information on spin state, oxidation state and magnetic ordering. 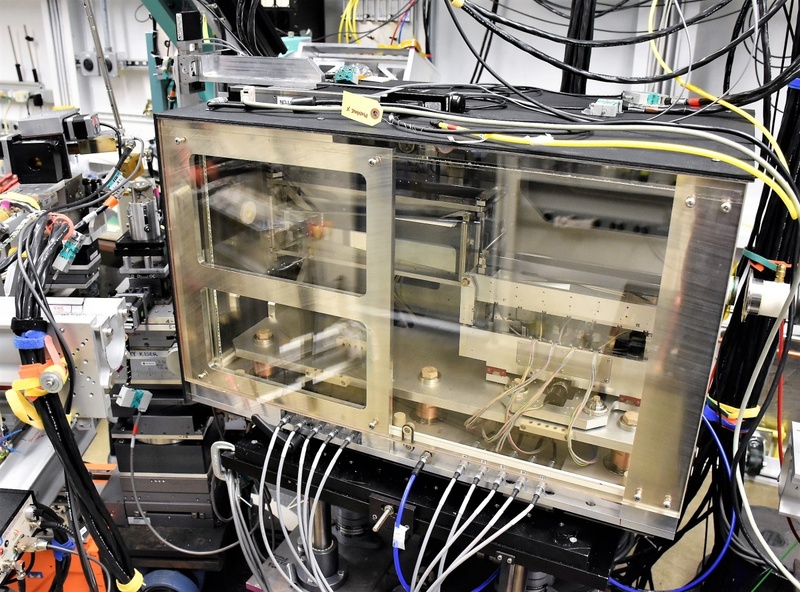 57Fe nuclear resonant x-ray spectroscopy has attracted particular attention among physicists and geophysicists because Fe is an archetypal transition element and is a dominant component in the cores of the Earth and other terrestrial planets. At HPCAT, a 2-meV high resolution monochromator (HRM) is used for 57Fe and consists of 2 channel cut silicon crystals (Si( 4 4 0) and Si (9 7 5)). We can now routinely measure NRIXS under high pressures using panoramic DACs and two or three APD detectors in close proximity and NFS while under high pressure and low temperature. During NRS experiments, the bandwidth of the undulator beam is reduced to ~1eV by a liquid N2-cooled Si (1 1 1) double crystal monochromator (DCM) in 16 ID-A. After going through HRM in IDC, the bandwidth of X-ray beam is further reduced to ~2meV. The beam then is focused by KB mirrors hitting the sample in IDD. NRS signals are collected by one avalanche photodiode detector (APD) at the forward direction for an NFS experiment or multiple APDs which are put as close as possible to the sample for NRIXS experiments.